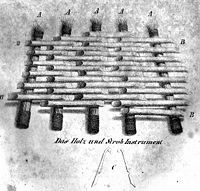 The xylophone is a percussion instrument consisting of wooden bars, graduated by pitch and length, which are struck with hard-headed “beaters”. There are hollow metal tubes below the bars to act as resonators. It is much like the glockenspiel from which it differs in having wooden instead of metal bars, which give it a less bell-like tone. It seems to have come to the public’s attention through the efforts of a travelling “virtuoso”, one M.J. Gusikof (died 1837). It then languished until brought back to life in the 1870s. It enjoyed its first taste of concert hall glory in 1874 when Camille Saint-Saens used the xylophone to represent the rattle of bones in the ghoulishly atmospheric ‘”Danse Macabre.” It found a permanent place as a paid member of the symphony orchestra when it was written into the score of Gustav Mahler’s Sixth Symphony. This page was last modified on 16 September 2016, at 17:23.